The following are a few more photos and bits of information about women aviatrixes from history. Andy Heins continues to send me background information and I am finding the pictures and whatever historical documentation is available fascinating. The pictures are wonderful but it’s truly the information about each woman that brings them to life. Annette Gipson was born in 1912 in Commerce, Georgia. At 19 she moved to New York City to seek her fame and fortune. She was taught to fly in 1931 and soon became involved in all things aviation related. -In 1932 she entered the National Air Races in Cleveland, Ohio. -In 1933, Annette created the Annette Gipson All Women Air Race at Floyd Bennett Field with help from I. J. Fox. Many famous women fliers participated in these races from 1933-36, with her friend Amelia Earhart acting as the official race starter. -In 1934, Annette married prominent New York attorney Edward T. Magoffin, 40 years her senior, honeymooning on the luxurious liner Queen Mary. She joined the 99’s as well as the Women’s Aeronautical Association. Soon she established residences in New York and Miami, Florida, building a gorgeous home on 10 acres complete with a special clubhouse for her friends in aviation. -In 1931 she purchased a Waco QCF-2 NC11465 and began touring the southern states giving flying exhibitions, racing and giving rides. In 1934 she was one of 19 women participating in the Women’s National Air Meet in Dayton, Ohio, where she placed second in the 20 mile Free-For-All Handicap Race and forth in the Precision Landing Contest. She passed away in the late 1980s. Florence Klingensmith 1904 – 1333. Florence Gunderson Klingensmith was born on a small farm in Oakport Township near Fargo, North Dakota. Somewhat of a “tomboy”, she was an active participant in all sorts of sports and was fond of riding her motorcycle at great speeds. She left high school during her junior year and went to work as a motorcycle mechanic and truck delivery person in Fargo, ND. Florence became interested in aviation during 1927 when Charles Lindbergh visited Hector Field in Fargo after his trans-Atlantic flight. The following day, September 4, one day after her 29th birthday, she entered the $10,000 Frank Phillips Trophy Race and was the only woman participating against a field of experienced male fliers. On the 8th lap of the race, after averaging over 200mph per lap and in 4th place, bits of fabric could be seen ripping away from the wing of the airplane. Florence flew off the course towards a field to the south of the airport when the airplane was seen to nosedive into the ground. Apparently, she had attempted to bail out but had become entangled in the airplane and was killed instantly. This ended the brilliant career of Florence Klingensmith and the officials barred women from participating in any closed-course racing from then on. Gladys received her license at age 25 in 1929, becoming the only licensed woman pilot in Long Beach. With only 40 total hours of flying, she entered the 1929 Women’s Transcontinental Air Derby, flying a Waco CTO Taperwing. The race was from Santa Monica, CA to Cleveland, Ohio. Being the lowest time pilot in the event, she did exceptionally well, placing second behind Louise Thaden flying a Travel Air. In 1931 the Transcontinental Air Derby race was changed and now women could compete with men. Gladys flew hard and fast against overwhelming competition and placed 6th flying her Waco Taperwing. Gladys was becoming very well known amongst pilots. She flew in the 1932 Cord Cup Pacific Wing Race and placed forth. She then won the 1932 Aerol Trophy Race. 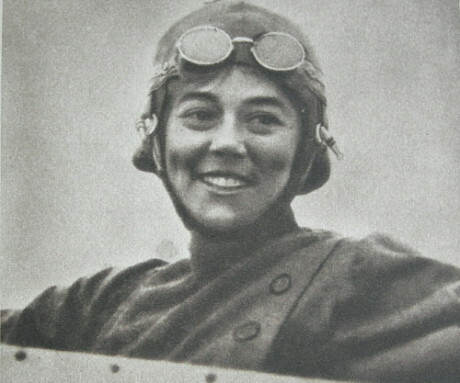 In 1933, Gladys again flew in the Aerol Trophy Race, placing third. In 1934, she was invited to participate in the first Women’s National Air Race in Dayton, Ohio. She was active in the Republican Party until her death from cancer in1973. Edna Gardner Whyte 1902 – 1992. Edna soloed on December 8, 1930 flying an OX-5-powered Swallow TP biplane and in early 931, she received her Private Pilot’s License. – She continued to fly and soon bought an OXX-6-powered Travelair. Figuring that she could serve a purpose with her airplane, she joined the Betsy Ross Corps, an organization using airplanes to help deliver aid to people for humanitarian reasons. In 1931 she attended the National Air Races hauling parachute jumpers. – She received her Transport Pilot License and entered the1933 Annette Gipson All Women’s Air Race and placed 5th. In 1934 she again entered and this time she placed first among some of the best women flyers in the country, flying a Waco 10. – In 1934, Edna participated in the first Women’s National Air Meet. In the featured event, the 50-mile Free-For-All Handicap Race, Edna was leading the pack flying a Wright-powered Waco Taperwing. Rounding the pylon on the last lap, she dove to the inside to avoid a collision. The wake of her airplane caused Frances Marsalis, also flying a Waco, to lose control and crash, killing her instantly. Even though Edna finished first, she was disqualified after protests from the other competitors. – In 1935 she applies to Central Airlines but is rejected because she is a woman. – In 1938 Edna is featured by “LOOK” magazine as the highest time woman pilot with 2,888 hours. -In 1940 Edna applies to yet another airline, this time Braniff. During the interview she is told that “passengers would not be comfortable with a woman pilot” and therefore they could not hire her. -In 1969 Edna purchases a tract of land in Roanoke, Texas and builds an airfield called Aero Valley. She continues to instruct students and race up into her late 80’s. In February 1992, Edna passed away at age 89, having won over 130 air races and with over 30,000 flight hours to her credit. Katherine Cheung 1904 – 2003. Born in Canton, China, her family immigrated to the United States in 1921 and took up residence in California. -The first Chinese-American woman to receive a pilot’s license. She accomplished most of her training in a Waco INF. -Katherine soon joined the Women’s International Association of Aeronautics and began flying in Air Shows and exhibitions up and down the California coast. -Although Katherine did not attempt any records for women, she did participate in a number of smaller air races. Her main interest was flying to cities with large Chinese populations to encourage flying, especially among women. The Chinese community was so enthralled by Katherine that they pooled their money together and purchased a Fleet Model II powered by a 125 hp Kinner engine so that she could represent them in the Ruth Chatterton Air Sportsman Pilot Trophy Race from Los Angeles to Cleveland, Ohio, where the National Air Races were taking place. -In 1937, Katherine had a vision to return to China and establish a flying school. Once again, the Chinese community in California backed her and purchased a Ryan STA for $7000 so she could train future pilots in China. However, fate stepped in and changed everything. Shortly after receiving the brand new Ryan, her cousin, the one who introduced her to flying, took the aircraft for a joy ride and crashed, destroying the aircraft and killing himself. During this same time, her father, in ill health and dying, asked her to give up flying. Out of respect for her father, she gave up flying making her last flight in 1942 at the age of 38. Although she remained interested in aviation, she never again flew and passed away on September 2, 2003, at the age of 98. Great site. I am looking for photos and information on Crystal Mowry. She was a flyer and good friend of Annette Gipson. Please help me in this area. Annette Gipson was my great aunt. She was my grandmother’s (Gussie Mae Gipson) sister. Another sister became a South Carolina race-walking champion. My grandparents were poor cotton farmers who lived about twelve miles outside of Commerce, Ga. I grew up on the very cotton field that has a connection to Annette Gipson. My dad always told his childhood christmas story of how his dad cut a runway out of the cotton field for Annette to land. She would fly from Miami to bring old toys to her sister and her kids. I can only imagine how magical that was. She even took her sister (my grandmother) up fo a ride. I remember my grandmother saying that she would never fly again. About the only other thing I know about her is that she kept alligators in a pond as pets at her Miami home. I hope this is of interest to anyone out there. Trevor…. that’s such an interesting story and we’re so glad that you chose to share some of your memories with us. It’s not easy for us today to understand the difficulties that women aviators faced back then. You must be very proud of your great aunt, and please know that we fly today for, and because of, women like her. Annette and Crystal were good friends in the the 1930’s. would you happen to have any pictures of the two of them? Regarding Edna Gardner Whyte… the airport she bought, Aero Valley, is still a busy little airport called Northwest Regional (52F), which a large number of airplanes call home. It sits nestled between the Denton, Alliance, and DFW airspace and has a nice little cafe, a well-stocked pilot shop, and many other services. There are even some pilots here who can tell stories from their days as students of Edna! C’mon by for a visit! Great pictures – enjoyed seeing a little bit of aviatrix history. Oh, yes, and she is also a taildragger pilot! Judy, these are awesome photos of these wonderful aviatrixes. Thank you to Andy for sending them. I enjoy reading the history of those women who came before us, making this an environment in which we can freely participate. I just returned from an incredible 99’s conference in Vancouver, Canada, at which Rosella Bjornson was the featured speaker. Rosella was the first female commercial airline pilot in Canada and pioneered the field for women in many ways, including fighting against being labeled unfit for duty simply because of pregnancy. She was a delightful presenter and I highly recommend her for any events in which the female flying community desires an inspirational speaker.